Taken with a Canon AE-1 Program and 50mm lens on Ilford FP4 ISO 125 film, this is the lifeboat ramp at the beach in Penarth South Wales. It was a pretty bright day as can be seen from the exposure on the sky, it was however freezing cold though as if memory serves me correctly this was taken in December, and in the distance you can just about make out the other side of the Bristol Channel and England. I like how the actual lifeboat launch leads down into the sea, darkness leading down into grey, and how the waves lapping up towards the bottom of the shot leads your eye back towards the darkness of the pebbles. 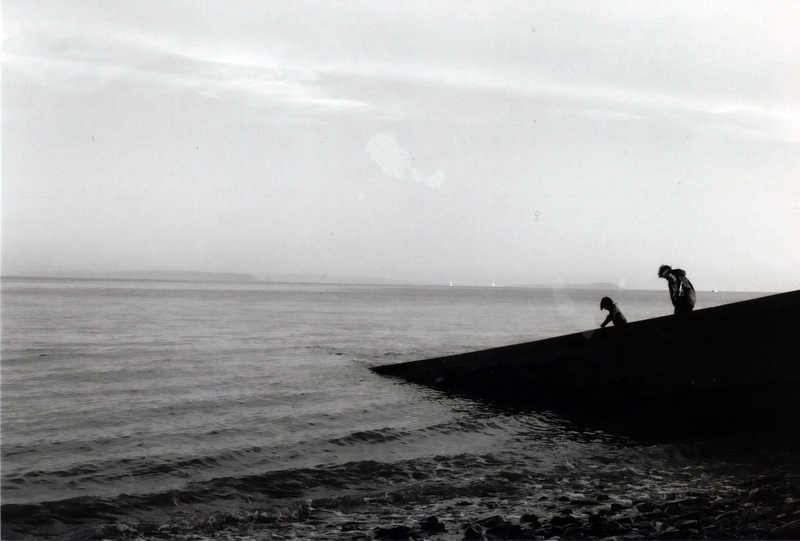 Perhaps what pleases me most about this shot is the silhouette’s of the two children playing, I have no idea who they are and they appeared as if from nowhere but I think without them this shot wouldn’t be composed anywhere near as nicely as I think it has. One thing I do think is what are they doing there? There’s a sign not far away that says to keep off the launch itself, boys just being boys I suppose.